Who said quirky threads were for our clothes alone? Happy Knots is using spools of thread and yarn to create pretty jewellery and accessories too. Kitsch and colourful, Happy Knots has us clearing more and more space in our accessory drawers and earring stands to make room for these handmade beauties. Mixing elements like threads, feathers and yarn into their designs, these guys are adding a touch of whimsy and a pop of colour to our accessory collections. 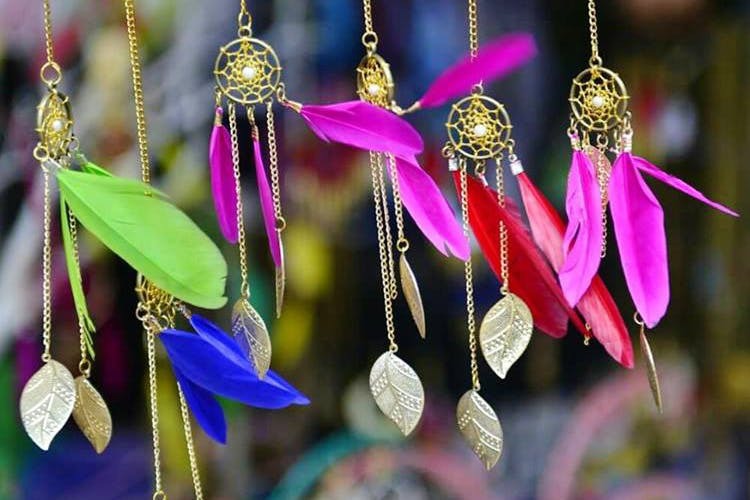 You can find conversation starters like crochet hoop earrings to dreamcatcher pendants in their range of merch. You can also find ear cuffs, cutesy hair bows, bejewelled hair bands, metallic hair chains and other accessories in their line of baubles. Open to customisations too, feel free to play with colour and design and Happy Knots will get a piece made according to your specifications. Still waiting to board the dreamcatcher train? Get your dreamcatcher from these guys as it’s apparently their most popular item. The prices start at INR 150 and go up to a reasonable INR 750, so you don’t need to burn a hole in your pocket for these. Order them through their Facebook Page here. Almost six years old now, Happy Knots was started by Anne Rakesh who discovered her passion for crocheting and threadwork after making many crochet accessories for her then newborn. Today, Anne and her husband Rakesh have turned this hobby into a business project. An online enterprise, most of their purchases can be made via Facebook. But you can also catch them putting up exhibitions as often as twice a month. What’s more, you can learn to crochet or make your very own dreamcatchers by signing up for their workshops. Stay tuned to their Facebook page here to keep a track of their schedules. Happy Knots also styles and decorates venues for big celebrations like weddings, parties and more. Hit them up if you’re looking to throw a big bash soon.